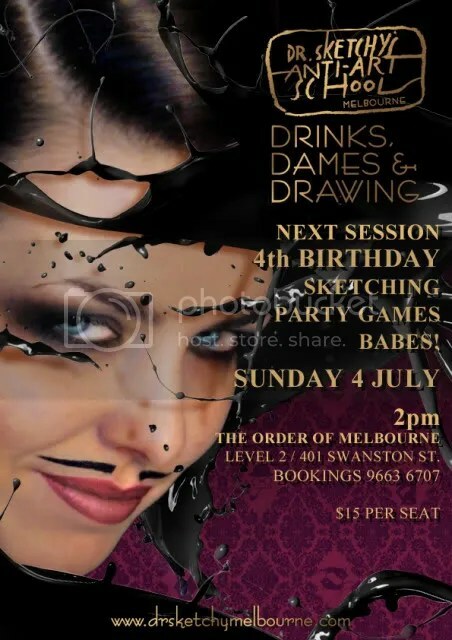 Dr Sketchy’s Melbourne turns 4!! Dr Sketchy’s 4th birthday session will be held on Sunday July 4th with burlesque rocker Madame Trolley Dolly of The Diamond Dolls who is bringing the birthday party to us! Madame Trolley Dolley recently appeared at The Meanies 21st Birthday celebration and is set to bring more of her party antics with her! Come along to sketch one of Dr Sketchy Melbourne’s most loved performers, join in party games and have a birthday cocktail or 3! What a tremendous 12 months we’ve had! Popping at the seams at The Butterfly Club we relocated to the wonderful, spacious and centrally located Order of Melbourne. Extended our sessions and moved them to Sunday afternoons, brought crafty sketching madness to Boogie festival over the Easter break, and traveled to New York to present at the 2nd International SketchyCon. Next up is the will launch of free workshops for 13 – 20 year olds in conjunction with Signal, an initiative run by the City of Melbourne inspired by the success of ArtPlay at Birrarung Marr. Signal provides opportunities to work with professional artists across all art forms. Signal is a place for making, showing, inspiring and developing our city’s new creative talents – in every medium. To celebrate these achievements we think it is high time we put on a special event for us all to come together and really get loose! 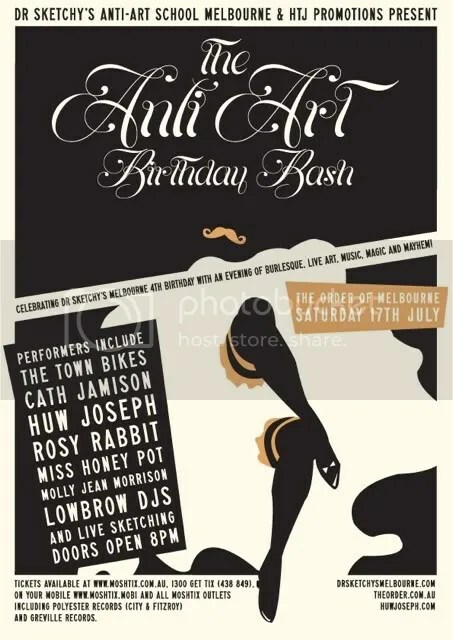 Dr Sketchy’s and HTJ Promotions present – The Anti-Art Birthday Bash! Join Dr Sketchy’s Melbourne for our biggest, most elaborate event ever, with a night of burlesque, music, magic, live sketching and mayhem! Revelers are invited to this explosion of performance and art on Saturday July 17th at The Order of Melbourne where some of Australia’s most eccentric performers will work the evening into a frenzy! EVENT DETAILS FOR YOUR DIARIES! Dr Sketchy’s Melbourne is about to undertake workshops with Signal once a month on a Friday evening for the next 6 months as part of a regular programming of Friday night creative workshops at this new space.